SCAR had been growing in size and complexity but it had not really grasped the importance of internal change in maintaining its key role as an international co-ordinator for all Antarctic science. The growth of Antarctic interests and activity in other NGOs was beginning to challenge its leadership but its structures were still much the same as in 1970. 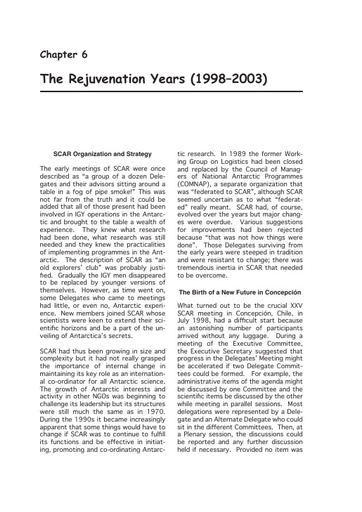 During the 1990s it became increasingly apparent that some things would have to change if SCAR was to continue to fulfil its functions and be effective in initiating, promoting and co-ordinating Antarctic research.